We smashed the glass out of a bus stop one night. We unearthed a metal tee box from our neighbourhood golf course and crept back across the road dodging the streetlights where our target waited. Brian tossed first. He winged it side-arm, limbs flailing and hair wild. Brian was smaller than me, but quicker, and the brains in our outfit. The glass didn’t break on the first impact, it rippled. The clang echoed off the houses across the boulevard. The tee box tumbled to my feet. Brian skipped away squealing with laughter as he turned to watch the rest of our liturgy. Brian later claimed his throw weakened the glass – like the window pane had a health-meter and all I had to do was finish it off. I was big for my age. Big for any age. At Brian’s house, his dad always called me “husky” – not fat – and made me compare my “linebacker hands” to his. When I tossed the tee box, it shattered the bus stop first crack. The glass flicked to white and hovered in place for a split second before it all cascaded at once. A Value Size box of Rice Krispies turned upside down over the kitchen floor. The smithereens danced into the street and then stopped to think. Kids our age still had sword fights with hockey sticks and garbage can lids. 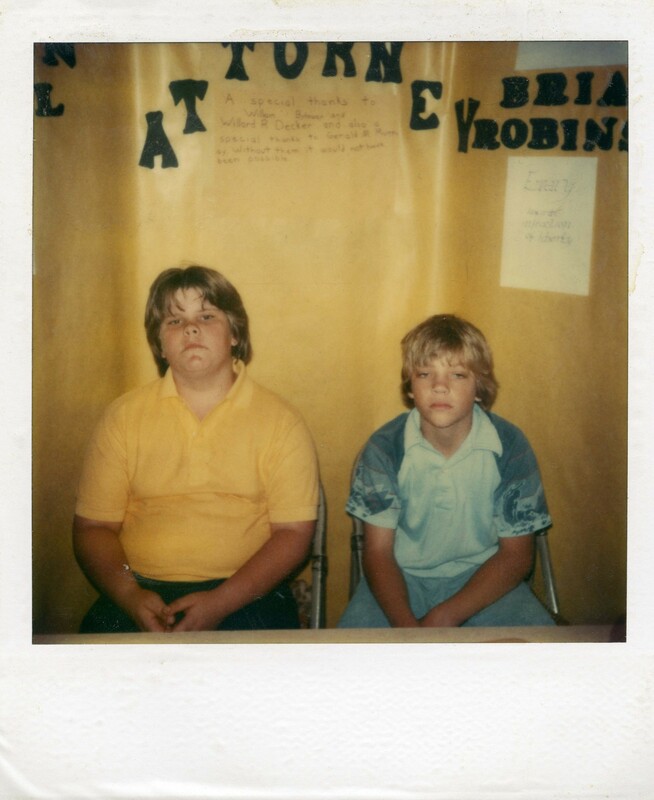 Brian and I were in summer school, again. On that Monday morning in July we sat in our bus stop and waited for our bus, scraping cubes of glass into piles with our feet. Robin knew Brain wouldn’t listen to him. Yellow. He told him to wear yellow. They were supposed to represent a firm together. If this were real, they’d never win a case. Brian could care less what Robin wanted. He couldn’t even believe Mrs. Parker partnered him with Robin anyway. He didn’t want to be a lawyer when he grew up. He didn’t even know what he wanted to be when he grew up, but if Robin was going to be a lawyer, he definitely wasn’t going to be one. Wear yellow, Robin had told him. Brian chose blue to see what Robin would do. Robin wanted proof to show his future employer he’s known he’s wanted to be a lawyer since his first career day – this first career day. And not even just that, but in charge of his own firm. Brian better be taking this seriously. He couldn’t believe Mrs. Parker would make him work with Brian. Of everyone in the class, it had to be Brian. Robin needed him to be looking like his partner, not his client. Be serious, Robin said. Forget that. Was this serious enough for him? He showed up didn’t he? Brian tried telling his mom he was sick this morning, but she didn’t believe him. Robin figured out Mrs. Parker must be preparing him more for what he’ll face in the future. This must be a test for what the real world will be like. Good, old, Mrs. Parker. Brian was almost certain Mrs. Parker hated him. That had to be the reason why she made him do this. And why she wanted a picture of it. Would this day ever end?